Not long ago it was easy to think of photojournalism as a dying art. Its successful remediation on the web now suggests a very different if less predetermined story. In fact, you could argue that we are experiencing something like a renaissance of the art. One sign would be that we are surrounded by many dazzling images that we take for granted. Another comparison would be that photojournalism today at times achieves the powerful aesthetic and ethical values of Renaissance humanism. This may seem a stretch, but I’ve seen two images this week that stopped me in my tracks, and for the same reason. The first is a profile relief by the Florentine sculptor Desidero da Settignano, who is the subject of a retrospective at the National Gallery of Art. Ostensibly a “Young St. John the Baptist,” the figure is a stunning depiction of a young boy as if in the flesh, and of the grace and wonder and vulnerability of childhood, and of human being in all its individuality and curiousity. The caption reported that this was a ritual immersion in recycled oil during the celebrations in Managua, Nicaragua for its patron saint, St. Dominic of Guzman. As before, a religious scene is the pretext for isolation of the individual person. We see in his face, eyes, brow, hands not idiosyncrasy but rather a profound depiction of individual experience captured within visible form. I have seen many Renaissance sculptures that are nearly identical in features and effect. The oil gives the image the feel of sculpted stone or metal, and it seems that the man’s human distinctiveness is emerging out of the block of inert material. I could look at it, and learn from it, for hours. Photograph of “The Young St. John the Baptist” by Desiderio from the Museo Nazionale del Bargello, Polo Museale Fiorentino, Florence. 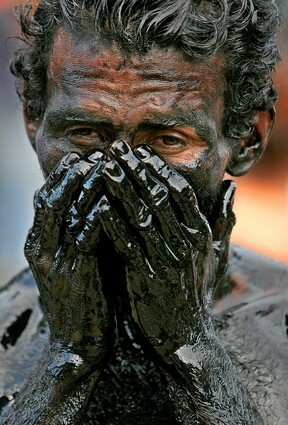 Photograph of Nicaraguan man by Esteban Felix/Associated Press. ← Previous Post"For Now We See As Through A Glass Darkly"
Next Post →Who is that Man in the Picture?